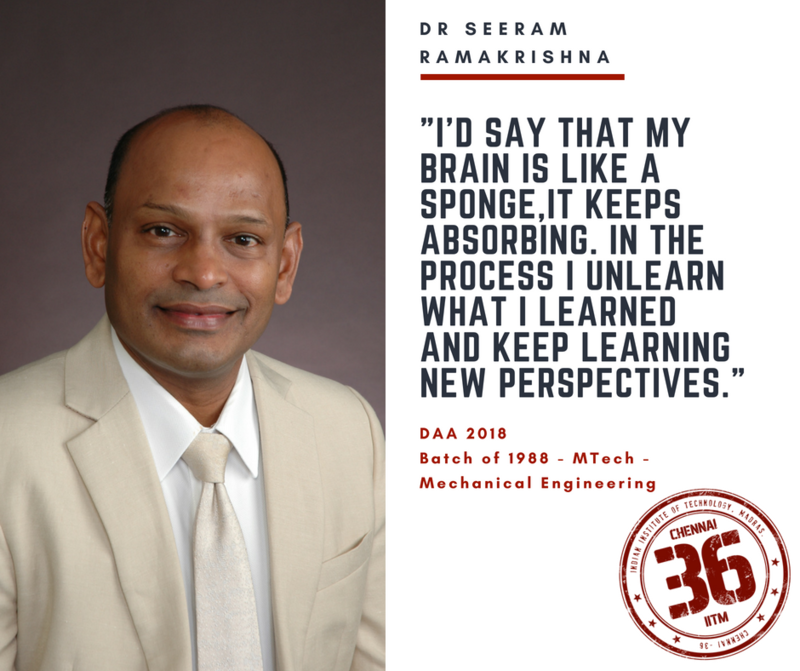 Dr. Seeram Ramakrishna, Director of Centre for Nanofibers and Nanotechnology at the National University of Singapore, completed his post graduation from Department of Mechanical Engineering in the year 1988. He is the co-founder of Global Engineering Deans Council and also an editorial board member of international journals. It was a matter of immense pride for Chennai36 to interact with him a day before he was conferred the Distinguished Alumnus Award for 2018. Read on to know more about his academic journey, his perspective on current research scenario, etc. Your academic journey as a student, from Andhra University to IIT Madras, to the University of Cambridge and finally to Harvard is enviable. Could you tell us what was particularly unique about the academic training that you received in each of these places? Firstly, I’m glad that you have taken interest to know what I was thinking when I was of your age. I think it was a fantastic journey. Though I didn’t know actually what I was getting into. When I joined Andhra University, not many people from my village went to a university. So, there were not many people who could tell me what to look out for in a university education. But they all were proud of me going to a university. When I reached there, I found students from other regions. This was the first time that I was seeing diversity in motivation, why they came to the university and their aspirations. Professors looked at us as young people who still didn’t know the world and treated us like their own children. After AU, I joined Hindustan Aeronautics Limited which had an arrangement to do Masters Program at IIT-M. So, I could learn while I was actually doing a professional engineering job. At IIT, it was a much more open process. The way lectures engage the students, made us think critically and much more broad-based. In a way it was quite different from AU. My fellow students were from across India having different mother tongues and appearances. And of course they didn’t look like me! So I was wondering how to fit in. Fortunately, we were able to form teams, play games, etc. While we were learning, we were also debating, discussing topics beyond classroom. IIT professors felt that I had a research element in my brain. I thought I was never made for that. But they advised me to go for a PhD in University of Cambridge. A senior student (Prof. Kamaraj) guided me through the application process. I ended up in Cambridge University and my world opened up even more. Because students in Cambridge University are from rich backgrounds, not in terms of wealth but in terms of their own intellectual thinking, which is far more deeper, different and broader. My professor there once said, “Seeram, you are doing your Ph.D. I’m not training you to become a technician. Once you finish your Ph.D., you would know how to think on your own and would no longer follow others.” It was a fantastic way of saying that I had to build myself. Then I became a professor but felt a need to have management skills and eventually ended up in Harvard, where it was even more of a different environment. My fellow students were now top artists, the chief of police in NYC, social leaders, entrepreneurs etc. As each time I went to a different university, my mind opened up more and more. I’d say that my brain is like a sponge, it keeps absorbing. In the process, I unlearn what I learned and keep learning new perspectives. My mind has been changing always, and educational exposure has given me the confidence to open up and share my mind with others while listening to them intently. A lot of your research has resulted in patents that are applicable in the real world. What do you think guides purposeful research that translates into applicable technology? In a philosophical point of view, human needs have never changed. Let’s say humans have been around for 30,000 years, more or less all the human needs have been the same. They want to have food, security, friends, communication and a place to stay. Nothing has changed if you look at the last 30,000 years. We devise and use different modes and solutions, to address the same needs. What I emphasize to my students is that whatever we do – it’s about meeting the needs of the people in different ways and I remind myself and others we are basically engineers. Engineers do advanced research, but it’s more about solving a particular problem – providing a solution. So, that’s what you call innovation – and when you protect it, that becomes a patent. That’s different from what we call real fundamental science. For example – if you tell me that the cells are there and that they’ve divided as expected, that’s not fundamental science. that’s engineering. But if you tell me that perhaps this is the nature of life – the cells are living, there is a life there – if you can give a mechanistic understanding of life that is basic science. In the world, there are only a few people who do basic science. Most of us whether one is a mathematician, biologist, physicist, engineer or some other professional, are all in a broad spectrum of application-motivated research. We view it basically, but it’s actually not fundamental basic research – it is another form or different intensity of application-oriented research. So, with that, I basically tell all my students, whatever we are doing is always related to solving a certain problem or meeting a certain need. The question is, do you want to build business and do you want to productize them? If that’s what your interest is, then go for patenting, that gives you the intellectual property protection – after that, it’s about converting a patent into a reliable and useful product. That’s basically my philosophy when I think about how to guide and support researchers to realize their own goals in relation to the society. We learned that you are an editorial board member of international journals and an editor of Elsevier journal of current opinion in biomedical engineering. What are your comments on mushrooming of fake journals in India? How should we tackle a phenomenon like this? The journals are there to support peer-reviewed research. There would be about two million researchers on the planet and 10 million research papers coming out every year. This much output is being captured by the journals. The rating of universities, and researchers and faculty members’ promotions, tenures, rewards, recognitions across the world are related to the scientific output and quality. India and as well as other developing countries are beginning to build high quality and competitive research ecosystems with accompanying rewards and recognitions. Some researchers would try to find shortcuts to grab the benefits. But India has very vibrant journalism and media when compared to other countries. This means that they can change the value system by observing what’s going wrong, reporting it and make sure that the system constantly moves from the current state to a higher quality, world-class scenario. That could happen. Because India is not a new country. Critical thinking has always been there as a part of our strong culture. Could you tell us about your life at the campus? Were there particular places that you liked to hangout at, or were there professors you had nice memories with, or any sports, culture involvement? Well, I discovered I’m a sportsman after I came to IIT. Because I wasn’t doing much of sports, my parents were more worried that if I get into sports, I might get injured and I might get disabled – so it was not a good idea for me to be seriously involved in sports. That was their thinking. Then, when I came to IIT, there were good facilities to start with. We would play tennis, table tennis, volleyball and we also had time because it’s very structured in a way where you do attend your lectures, then you have time to dine out or hang out with students. And the second part is, the professors give you a particular assignment and they let you have your freedom to pursue it so that you can manage your time. Hang Out places for me were always the nearby coffee places because I don’t get sleep so early. I had to get out and disturb others. I’d have one or two coffees with my friends. The other thing about me is – I have more questions than answers. So, I can keep asking questions and I asked all kinds of questions So, any conversation (including this interview) I’m sure we can go on for hours because I tend to ask naturally inquisitive questions. How about some memories that you would want to forget? It’s interesting that in my life I’ve never had any memory that I’d like to forget. It doesn’t mean that I haven’t had bad experiences. Maybe because I’m a deep thinker in my own way, I learn from every incident. The whole bad experience turns out to be one of my stepping stones for further learning and also makes my own mind clearer. All of us, as we grow up, gain a lot of experience, intentionally and unintentionally. These can be imagined to form knots in one’s brain which need to be untied. For that, all you need to do is reflect and give your mind some time and it will untangle on its own. You come from Andhra, and of late, there are are a lot of Andhra messes around campus. Were there any in your time? If not, what were the food places you visited around campus? Those days, there were not many Andhra messes and Andhra food is known for a few reasons. I come from Guntur – it’s known for the hot chili – one of the hottest in India probably. People say that the food from Andhra is very spicy. But it’s actually not spicy, it’s just chili. Of course, there’s also the standard Gongora and the gun powders amongst other things. But we didn’t get them around IIT. So we used to go out, to Mount Road – there were a couple of Andhra restaurants there but they were expensive and as a student, you can’t go there every other day. So we used to fast intentionally so as to eat enough for our money’s worth. We would starve from morning perhaps and go for dinner, eat and come back. Afterward, we used to eat Paan – After eating spicy food, Paan felt good. And we’d feel like we’ve accomplished something – I’m not sure what we accomplished but we felt like we did! Could you tell us about research facilities in NUS and about the startup culture in Singapore? I’ve been in Singapore for almost 25 years now. I’ve seen it’s transition from an almost no research place to a world-class-research-place. Over the past 15 years, Singapore has started investing substantially in research. Just to give you an idea, India spends less than 1 percent of its GDP on research, whereas Singapore is now spending nearly 2.7 percent of GDP. As India is a large country, it relies on quality control within the country. When it comes to Singapore, which is smaller, quality control is done globally. This means that the research ideas (which are well funded) are compared and criticised on a global platform. This happens every year. That’s one reason why research has flourished in Singapore in such a small span of time. Could you please tell us about the focus areas in nanotechnology that a country like India and an institute such as IIT Madras should invest in? For people to understand better, Nanotechnology is – bigger than atoms but smaller than a millimeter. Why that is important is, it is understood then when you engineer materials at that length scale, they seem to have some interesting properties. The best example, is again in India is Ayurveda. Many of the nano concepts are there. Yesterday, I was talking to someone who set up a major educational institution in India and they are actually manufacturing Ayurveda medicines and they wanted me to infuse nanotechnology and I was telling them you guys started it and you’re telling me to infuse it! But yes, we’re going to do that, and that’s in Bangalore. If you consider Ayurveda for example, it already has nanotechnology but has not been very well documented. So by bringing modern scientific methods into technology, India could be a very strong pillar in the medicine sector, in Ayurveda as well as western medicine. Most of them are based on nanotechnology concepts. In India, with 1.3 billion people, I have noticed two things. People are growing older and people are becoming more affluent. They want better medical treatments and health care. So clearly these two sectors meet and India needs to develop its own newer products, formulations, and ways to treat patients. This is one way that nanotechnology could be tailored to meet Indian needs by IIT professors and students. Second, India needs energy. India relies heavily on coal as well as other forms of fossil fuels but they are polluting the environment. India is not necessarily the top polluter based on per capita but as an aggregate, it still has a lot of pollution. So, if you want to deal with pollution, you need to address the sources of pollution. One way is through energy generation, which is right now based on fossil fuels based – coal, oil, gas etc. Instead of burning them, if we can harness sun energy or other forms of renewable energy that would make India a much more liveable place. IIT usually has all the basic science departments. They have top engineering departments plus management studies and others. All these are needed if you want to come up with a paradigm shift in the way we solve energy problems. Now, I take from energy to other forms such as water. Water in India is considered sacred. I still remember, the last time I went to Mauritius, there was a very tall Shiva statue and I asked them, ‘What is this?’ and they said, ‘Well, it is donated by the Indian Government’ and I said ‘Wow, that’s fantastic’. Then they said, ‘Would you like to see it?’ and then they drove me there. They said, ‘Okay, since you’re here, why don’t you take a dip in the lake’ and I said, ‘Okay, but what is the significance?’ and do you know what they said? ‘This is our lake, but, some time ago, one saint came with a bottle of Ganges water and poured it there – now it’s holy water’. For the Mauritius people, it’s very important. I could sense the significance of water around the world. So, water is very important for life, but water chemistry is varied. For example, if you look at water samples from different parts of Chennai – the salinity is different. Also in groundwater, depending on the depths you go in, there are different minerals and different forms of microbes. And if you’re looking at how to make these types of water more drinkable, you need a wide range of technologies. And this is where nanotechnology comes in. It’s the same story if you want to convert seawater into drinking water. You see the use of nanotechnology. You see it’s usefulness in addressing basic human needs. One more basic need is food. Right now, a lot of food packaging can be improved by nanotechnology. Another is in modern communications. All these devices have a lot of nano concepts. You make the device faster using nanotechnology. You power the batteries in this device and that too is nanotechnology. Essentially you are already using nanotechnology. Right from food, water, energy to a living environment as well as modern communications technology nanotechnology is applicable in several areas. So, IIT, Chennai, and India can leverage nanotechnology. Are you aware of any startups at IITM research park that seriously engage with nanotechnology? I’ve been coming to IITM since early days of setting up nanotechnology-related projects. There are few professors from IIT Madras who come to my lab. There is a startup dealing with Lithium-Ion batteries. The idea is to make them more durable, with improved heat management. There is also a startup related to water cleaning using nanotechnology. They are looking at purifying water, especially in rural community. There is another startup with a focus on nanofibers for agriculture. I think all these are going very well. What do you think are the avenues for IIT Madras and NUS to collaborate on? and also what aspects of each other can they actually learn from? Several years ago, when I was Dean of Engineering at NUS, we were engaged with the HRD Ministry in the government of India when I established a joint PhD program between IIT-M and NUS. It was the first time I think that IITs agreed to have a joint PhD programme with an International University. We signed a contract, and it’s now being followed by most major IITs. So yes, we have already established a collaboration. I have a couple of students who work with me who are a part of this joint Ph.D programme. First thing about this is that all the administrative clearances are done – the policies are understood on both sides and support is available. More importantly, say you had to fly from Chennai to Delhi. It would take you probably the same amount of time to fly to Singapore, it’s basically very close. Secondly, Singapore has a good Indian diaspora. You’ll feel very much at home. Those students who’d miss what they get in IITs or in Chennai, will have access to the same things in Singapore also. There’s the comfort of language, high quality research infrastructure and good policy understanding in IIT. If you asked two hundred years ago, the place to go for research and studies in the world was UK followed by Germany and France. In the last hundred years, it has moved to the United States and in the last twenty years, you can actually see Japan, Korea, China, Singapore playing a huge role in terms of new research innovations. Singapore is one of the important actors in this area and the cultural affinity between Singapore and India means that IITs and NUS can and should and will and already are working together. My suggestion is that the future is not totally representative of the past. Even if it didn’t happen in the last 10-20 years, it doesn’t mean that it’ll not happen. Because the necessary conditions are already there, it’s just a question of when. I’ve noticed the change in the minds of Indian students, compared to the previous generation – who were all focusing on get a job. But students now, if I were to ask them, they’d say, ‘Sir, I want to do the job, but I also want a complete life’. What that means is, you want to do research, you want to learn in a balanced way – a way that they call ‘work-life-balance’. What that means is that these generations, would prefer a variety of things and that one of them would be Singapore. And that’s where IIT and NUS can explore these avenues.